I hate to nitpick, but I’d call those pavers because they are not naturally rounded. There is great beauty in the ordinary–and wow does this find it! I like this a lot. My version of something sort of similar was shot outside the Colosseum in 2002. 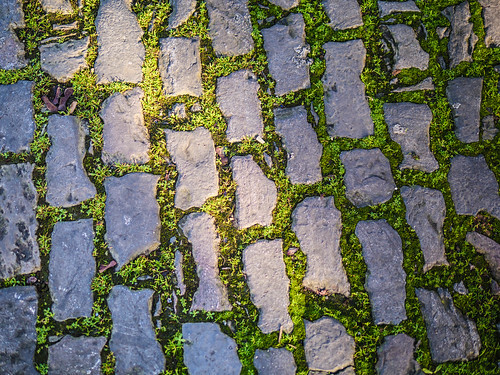 “Setts”, traditionally used by rioters as improvised weapons. Those paving blocks remind me of the ones you see in green spaces in Latin American cities, except they are more-or-less mirror images. The LA ones have grass growing in square openings in the block instead of in the gaps between them. Thanks, Collin @4. I should have guessed there was some other old-time name for them. Obscure vocabulary is a favorite thing for me. And I love the detail of being embedded in clay!